← Ma’am, step away from the scale! The fitness industry is constantly evolving since our society is constantly changing. Since our society has become more and more sedentary, people need to be taught to proper movement patterns. Because of this focus on proper movement patterns workouts have become more and more focused on functional strength. While classes like Zumba are becoming more popular as people are seeking out “fun” ways to workout (that seem less like working out) so is functional training equipment (YAY!). Here are some cool pieces of equipment that I hope to start seeing in more and more gyms! Kettlebells are probably one of the oldest forms of lifting equipment. They were developed in Russia in the 1700 and finally reached the US around the 1960s. They were once a common staple of the gym, but have since virtually disappeared. Recently though there has been a resurgence and now many kettlebell training certifications are available. One of the best ways to work your entire body and gain lean muscle mass! Sleds – A great way to improve your leg power! Pushing (or pulling!) 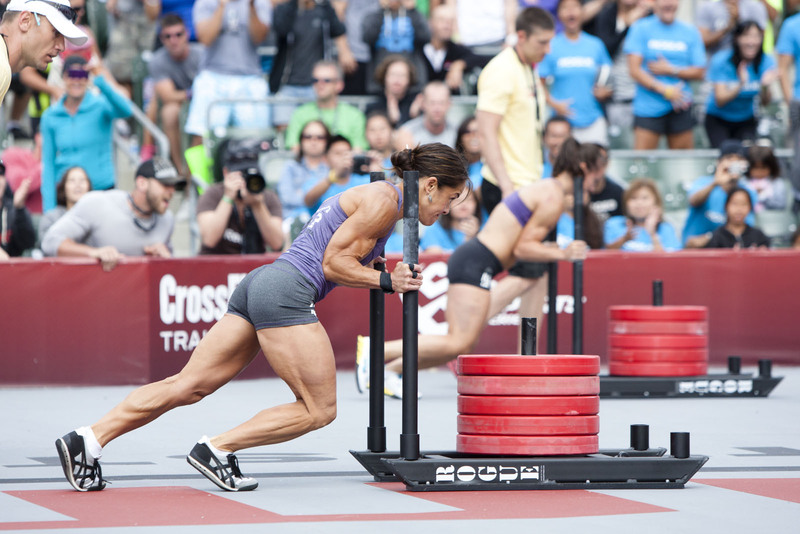 a sled is a great full body workout. While I love deadlifts and squats, pushing a sled can help you get pretty much the exact same benefits as both in one exercise! LOVE IT! You can see every one of Annie Sakamoto’s muscle fibers working! Heavy Ropes – These are not something I’ve worked with, but I can’t wait to! You can literally get a full body workout using these ropes. There are specific exercises with the heavy ropes that can target your upper body, core and legs. They also provide you with a very cardio workout! Sandbags – If you think lifting a dumbbell, plate weight or barbell overhead is hard, try lifting a sandbag of the same weight! Because the weight in sandbags can shift, you really have to use your core. This is a much better way to engage some of those core stabilizer muscles than a stupid bosu! Plus you are lifting something heavy, which you know I love! Sandbells and Waterbells – A variation of both the medicine ball and the sandbag, I thought these were just too cool not to include. what a great way to incorporate the sandbag into more exercises. These sandbells can also help you work on grip while you are getting all the benefits of lifting a sandbag and heavy weights! TRX bands – A Pilates-based movement system, the TRX is a great way to get in a full-body, bodyweight workout. The thing I love about the TRX too is that it can be used to teach beginners proper movement patterns, but also be used to challenge even the fittest of athletes! 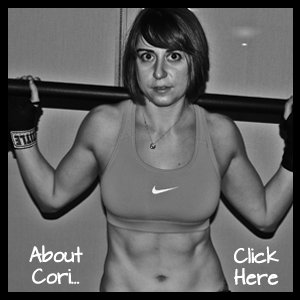 TRX Rip Trainer – This new piece of equipment actually started this whole post. I love the fact that this is a small, easily portable piece. Like the TRX, it looks like something that everyone can use. I can’t wait to try it! Foam rollers – I love foam rollers. While not exactly a piece of exercise equipment (although it can be used for exercises), it is essential to any functional workout. It is key to developing proper length-tension relationships and correcting imbalances! Tires – I love deadlifts and squats. BUT flipping tires can be a great substitute. 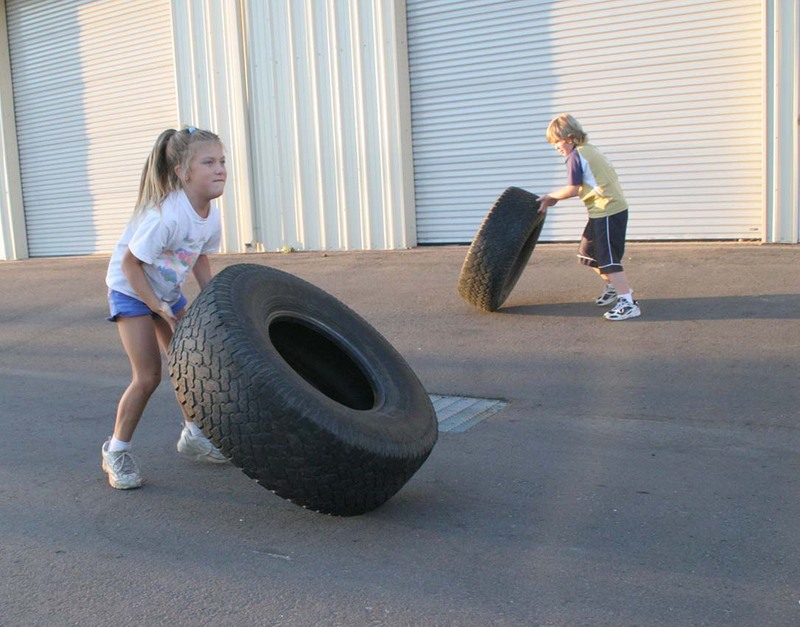 There is something about the idea of flipping a tire that just seems so Primal to me. I feel like this exercise came from cavemen and women who flipped rocks to prove who was strongest. Am I crazy? Probably. Everyone can do tire flips! And they are fun! Rings – Can we say DIFFICULT!?! Working out on the rings, whether you are doing muscle ups or not, is probably one of the hardest things EVER. I always love watching the gymnasts do them because you can see every muscle in their bodies working! All of these pieces of equipment can be used to give you both a cardio and strength training workout! Plus they work your entire body! What functional training equipment do you love? Posted on July 15, 2012, in Top 10, Workout and tagged annie sakamoto, Crossfit, fitness trends, full body workout, functional training, heavy ropes, kettlebells, rings, sandbell, sleds, tires, TRX, zumba. Bookmark the permalink. Leave a comment.